Pretoria - Witwatersrand - Vereeniging region, also known as the Southern Transvaal, has been re-named Gauteng (Sotho word for "Place of gold"). Up to September 1995 none of the 9 new South African provinces have adopted their own flags although one or two have proposals in this regard. There is currently a debate in this country as to whether the provinces should have their own flags or not with the ruling ANC holding the view that the provinces should not have individual flags. 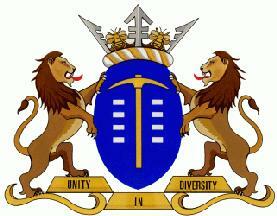 Gauteng province has, nevertheless, adopted new provincial Arms. In north eastern South Africa, reorganized from the former south central Transvaal. It borders the Free State, Mpumalanga, Northern and North-West provinces. The Gauteng provincial government flies a LOB - the provincial logo in the centre of a white field. This is not considered the flag of the province, but its use is similar to that of a corporate house flag, being flown at provincial government offices only. ARMS: Azure, a pick erect Or, accompanied on either side by four shield thongs in pale Argent; the shield ensigned of a coronet comprising a wreathed head ring alternately Argent and Or, heightened of four chemical symbols for iron Argent, alternating with as many honey-bees volant Or. SPECIAL COMPARTMENT AND MOTTO: Upon three gold staves fesswise, conjoined 2 and 1, supported by two ornamental brackets Or, the motto UNITY IN DIVERSITY. Registered with the South African Bureau of Heraldry on 20 March 1996. A rectangular flag in the proportion 2:3, comprising 13 equal horizontal stripes, those at the top and bottom red, the remaining eleven alternating white and blue; a hoist panel of three stripes, yellow, blue and yellow, the blue stripe being equivalent in width to three of the horizontal stripes, charged with six white stars in pale of six points each, the yellow stripes each 1,25 of the width of the horizontal stripes. Per pale Gules, Argent and Vert; on a roundel Argent the shield of the municipal arms. A rectangular flag per pale red, white and blue, the middle stripe charged with the shield of the Municipal arms. On a rectangular yellow field proportion three by two, bordered red, a blue griffin segreant coward, armed and langued red, and in each corner a red tulip. A rectangular flag with proportion three by two, consisting of nine horizontal stripes, from top to bottom green, yellow, red, yellow, blue, yellow, red, yellow and green, respectively 1/10, 1/25, 1/50, 1/25, 3/5, 1/25, 1/50, 1/25 and 1/10 the height of the flag, the blue stripe charged in the hoist with a white castle triple-towered and in the fly with four yellow roundels barwise, the diameter of each 1/5 the height of the flag. Illustrations of the above, with the exception of Mokwana, can be seen in SAVA Journal 1/92 [brL92] (ed).